In accordance with the leaked release date that appeared early last month, publisher Bandai Namco has slated Dark Souls III for a release across PlayStation 4, Xbox One and PC on April 12, 2016 in the Americas. That’s right, the Lords of Cinder loom large, and ardent fans of From Software series will be pleased to note that the RPG sequel will come packing two special editions. The first of which is the Day One Edition. Priced at $59.99, this particular Dark Souls III bundle comprises a strategy guide, the official game and soundtrack, and limited packaging. 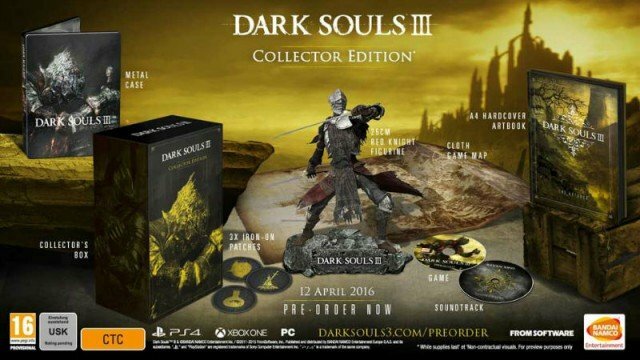 The Collector’s Edition, meanwhile, will be available for $129.99. Pitched as the premium package of the two, it’ll include all of the contents of the tier below along with a cloth game map, 10″ Red Knight statue and a slew of extras. Whether or not Series Creator Hidetaka Miyazaki is aiming to bring the curtain down with the long-awaited sequel will be told in time, though the developer did tease that the 2016 release will at least bring a sense of closure to the franchise. It’s official: Following its Japanese bow on March 24, From Software and Bandai Namco will release Dark Souls III across North America on April 12, 2016. And you can feast your eyes on the Collector’s Edition below.